Here is a quick and simple, protein packed recipe worthy of sharing with a friend – or four! 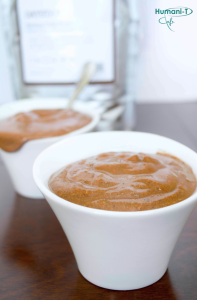 This vegan chocolate coffee pudding is mildly sweet, with subtle dark and rich notes of Humani-T’s very own Organic Fair Trade Coffee. Brew Humani-T Organic Fair Trade Coffee according to instruction, and allow to completely cool before use. Add all ingredients to blender and blend until smooth and of semi-thick consistency. Refrigerate pudding to allow cooling until ready to serve.